Synthetic peptide (the amino acid sequence is considered to be commercially sensitive) within Human ERK2 aa 150-250 (phospho T185). The exact sequence is proprietary. 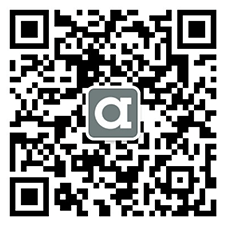 Our Abpromise guarantee covers the use of ab201015 in the following tested applications. WB 1/1000. Detects a band of approximately 44, 42 kDa (predicted molecular weight: 41 kDa). 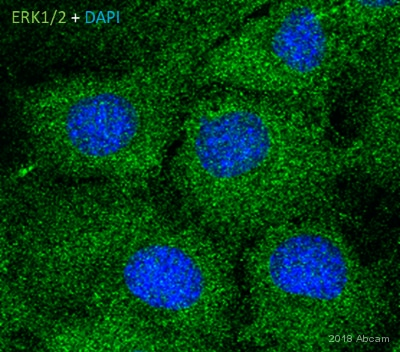 ERK1 (phospho T202) + ERK2 (phospho T185) with ab201015 at 1/500 dilution, followed by Goat anti-rabbit IgG (Alexa Fluor® 488) (ab150077) secondary antibody at 1/1000 dilution (green). Confocal image showing staining on M phase cells (PMID:26529125). After PMA treatment (200 ng/ml, 30min), the staining was increased, and LP treatment decreased the PMA induced staining. Tubulin is detected with ab7291 (anti-Tubulin mouse mAb) at 1/1000 dilution and ab150120 (Alexa Fluor® 594 Goat anti-Mouse secondary) at 1/1000 dilution (red). -ve control 1: ab201015 at 1/500 dilution followed by ab150120 (Alexa Fluor® 594 Goat anti-Mouse secondary) at 1/1000 dilution. -ve control 2: ab7291 (anti-Tubulin mouse mAb) at 1/1000 dilution followed by ab150077 (Alexa Fluor® 488 Goat Anti-Rabbit IgG H&L) at 1/1000 dilution. Immunohistochemical analysis of paraffin-embedded Human glioma tissue labeling ERK2 (phospho T185) with ab201015 at 1/100 dilution, followed by Goat Anti-Rabbit IgG H&L (HRP) (ab97051) at 1/500 dilution. Nuclear with weak cytoplasm staining on Human glioma is observed. Counter stained with Hematoxylin. The induction conditions refer to PMID:12454035; PMID:17026715; PMID:22206868. Dot blot analysis of ERK2 (phospho T185) labeled with ab201015 at 1/1000 dilution. Lane 1: ERK2 (pT185) phospho peptide: DHTGFLT(p)EYVATR aa179-191 peptide. Lane 2: ERK2 Non-phospho peptide: DHTGFLTEYVATR aa179-191 peptide. Lane 3: ERK2 (pY187) phospho peptide: DHTGFLTEY(p)VATR aa179-191 peptide. Goat Anti-Rabbit IgG, (H+L),Peroxidase conjugated (ab97051) at 1/100000 dilution was used as secondary antibody. Immunohistochemical analysis of paraffin-embedded hHman breast tissue labeling ERK2 (phospho T185) with ab201015 at 1/100 dilution, followed by Goat Anti-Rabbit IgG H&L (HRP) (ab97051) at 1/500 dilution. Nuclear staining on Human breast is observed. Counter stained with Hematoxylin. 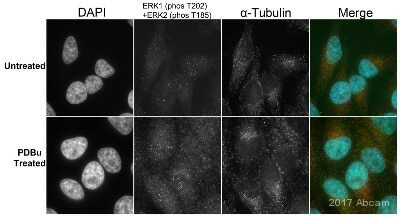 ERK2 (phospho T185) was immunoprecipitated from 0.35 mg of NIH/3T3 (Mouse embryonic fibroblast cell line) treated with 50ng/ml PDGF for 40min whole cell lysate with ab201015 at 1/30 dilution. 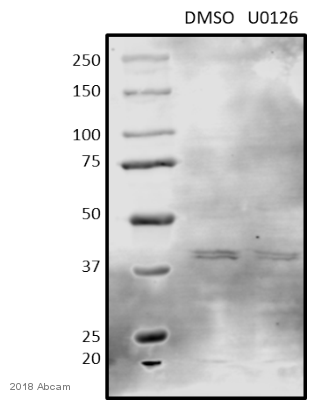 Western blot was performed from the immunoprecipitate using ab201015 at 1/1000 dilution. VeriBlot for IP secondary antibody (HRP) (ab131366), was used as secondary antibody at 1/1000 dilution. Lane 1: NIH/3T3 treated with 50ng/ml PDGF for 40min whole cell lysate, 10µg (Input). Lane 2: ab201015 IP in NIH/3T3 treated with 50ng/ml PDGF for 40min whole cell lysate. Lane 3: Rabbit IgG,monoclonal [EPR25A]-Isotype Control (ab172730) instead of ab201015 in NIH/3T3 treated with 50ng/ml PDGF for 40min whole cell lysate. ERK2 (phospho T185) was immunoprecipitated from 0.35 mg of PC-12 (Rat adrenal gland pheochromocytoma cell line) treated with 100ng/ml NGF for 10min whole cell lysate with ab201015 at 1/30 dilution. Western blot was performed from the immunoprecipitate using ab201015 at 1/1000 dilution. VeriBlot for IP secondary antibody (HRP) (ab131366), was used as secondary antibody at 1/1000 dilution. Lane 1: PC-12 treated with 100ng/ml NGF for 10min whole cell lysate, 10µg (Input). Lane 2: ab201015 IP in PC-12 treated with 100ng/ml NGF for 10min whole cell lysate.